Welcome to our comprehensive guide to choosing the best wet dog food! In this guide, we take look at the particular nutritional requirements of your dog and why some owners might choose to feed wet dog food. And we review some of the very best wet dog food products that are available on the market today. What is wet dog food? Wet dog food is super-tasty, meaty dog food that comes in cans, pouches, or trays. Good quality wet dog food has lots of protein and is easy for dogs to eat with less chewing. Some dogs find dry kibble rather boring and unappetizing, even though it contains just as much nutrition as wet food! Wet food is often served covered in tasty gravy, which encourages fussy feeders to tuck in. Why choose wet dog food? Puppies who are newly weaned find the transition from their mothers’ milk to wet food smoother than going straight onto dry food. Puppies who are teething often find dry food difficult or painful to eat. Senior dogs may have dental issues that make eating dry food uncomfortable. Feeding a senior wet dog food provides all the nutrition an elderly pup needs and it’s easier for him to eat. Fussy eaters can often be tempted to eat good wet dog food, whereas they won’t touch dry kibble. You can worm wet foods up, to tempt a poorly pup who’s lost his appetite back to the food bowl. Many owners choose to feed their dogs a combination of wet dog food and dry kibble. Feeding kibble is important as it helps to remove plaque from the dog’s teeth. This prevents the formation of tartar that could result in periodontal disease. What nutrition does your dog need? All breeds of dog require balanced nutritional content in their daily diet in order to remain healthy and to provide them with enough energy for exercise. Puppies need a diet that provides them with enough calorific energy for healthy growth and for playtime too. So, what nutrition does your dog need? Protein derived from good-quality meat products is essential for your dog’s well being and lean muscle growth and development. Look at the list of ingredients on the dog food packaging, and choose one that has at least two meat proteins. Protein can be delivered as meat, meat meal, or fish, but it must appear in the first couple of ingredients on the list. That indicates that the wet dog food you’ve chosen isn’t packed with cereals and fillers instead of healthy protein. Some dog foods contain veggies as a protein source. That’s fine, as long as the food contains more meat than plant protein. Fiber is important for a healthy digestive system. Meat does contain some fiber, but good wet dog foods contain rice and veggies for extra bulk. Fat is a very important source of energy for your dog. It’s also great for keeping your pup’s skin and coat in tip-top condition. Omega-3 and 6 fatty acids are essential to support eye and brain development in puppies. Good sources of fat that you’ll find in the best wet dog food include flaxseed oil, canola oil, and chicken fat. Check out this article for a fascinating overview of why a low-fat diet is not such a good idea for your dog! Carbs are needed in your dog’s diet to help maintain a correct blood-sugar ratio. Many wet dog foods include sweet potatoes to provide low-glycemic carbohydrate. So, although you don’t want to overfeed your dog with carbs so that he gets fat, his diet must contain some. Avoid wet dog foods that contain excipients. Excipients are fillers, colors, preservatives, and flavorings that are added to some cheap brands of wet dog food. They are of no nutritional benefit to your dog, and some can even be toxic. Check the list of ingredients on the product packaging. Also, if your dog is prone to tummy upsets, avoid choosing a wet dog food that contains corn, wheat, soy, and dairy products. Additives like these can lead to tummy upsets and chronic digestive problems, including diarrhea. Now, let’s have a look at some of the best wet dog food brands. A grain-free wet dog food is a food that does not contain soy, wheat, corn, barley or other cereal grains. Supporters of a grain-free diet for dogs maintain that grains are not a natural source of food for canines. Although that’s true, dogs have evolved to be able to digest gluten and grains relatively easily. So, the jury’s out on whether feeding grain to your dog is a good or bad thing. Consult you vet if you think your dog is sensitive to grains. The best-selling grain-free wet dog foods are manufactured by two of the industry’s giants, Purina and Hill’s. Purina ONE Smartblend Adult Dog Food is a grain-free wet dog food that’s made with real turkey and venison and presented as a tender, juicy meal that your dog is guaranteed to enjoy! The grain-free canned dog food diet also has natural glucosamine for healthier joints. The food contains no artificial preservatives, colors, or flavors, and absolutely no padding or fillers. Hill’s Science Diet Sensitive Stomach & Skin Dog Food is a wet grain-free dog food that’s specially formulated for dogs with sensitive stomachs and skin. The food comes in the form of a loaf and contains no additives, flavorings, preservatives, or fillers. As an added bonus, if your dog doesn’t like the food, Hill’s will give you your money back! Merrick Lil’ Plates Small Breed Grain-Free Wet Dog Food is made specially with the dietary requirements of small and toy breed dogs in mind. The first ingredient in these tasty recipes is real meat, poultry, or fish. Fresh farm fruits and veggies, including blueberries, peas, apples, and sweet potatoes are added for extra fiber and juiciness. Some wet dogs food are good for smaller breeds because of their ingredients, or the texture of the meal. Small jaws fare best against small chunks of meat! Wet food will perish once it’s open, so small breed meals often come in small servings to avoid waste. If you have a small breed, Cesar Classics Adult Wet Dog Food 3.5 ounce Poultry Trays could be perfect for your pooch! This wet dog food is poultry-flavored and contains extra vitamins and minerals for balanced and complete nutrition. The food comes in convenient, portion-sized foil trays with peel-off seals to minimize waste and ensure the food stays fresh. This food is AAFCO approved, so you can be sure it will meet your dog’s nutritional needs. Another excellent choice of wet dog food for smaller breeds is Hill’s Science Diet Small & Toy Breed Wet Dog Food. This wet dog food diet is made with fresh chicken and barley, providing a delicious, nutritious diet for small and toy pups. Hills are one of the most established manufacturers of veterinary-endorsed special diet pet foods. Their small breed food is made with only high-quality protein, promoting the ideal body weight for a smaller dog, as well as giving your dog what he needs for strong muscle development. Many small breeds suffer from digestive problems. Hill’s wet dog food is formulated to be easy on tiny tummies. When your pooch is still a puppy, it’s important to choose the healthiest wet dog food for him. That way, you can be sure that your pup’s muscles and bones will develop properly and his coat and skin will be healthy. During the first few months when your puppy is teething, it can be helpful to offer him a wet dog food that’s gentle on his gums. As the teething process finishes, you’ll be able to choose the best wet dog food to mix with dry kibble so that you can gradually wean him off the wet food completely. Here are our favorite puppy wet dog food options. Nutro Puppy Wet Dog Food has everything your puppy needs for the very best start in life. The tasty recipe contains high-quality pieces of chicken and turkey, drenched in mouthwatering gravy and boosted with the addition of rice for fiber. Pedigree Puppy Ground Dinner contains ground lamb and rice. Vitamins, minerals, protein and carbs are also included to provide your pup with everything that he needs for healthy growth and vitality. If you want to offer your puppy a completely natural wet dog food, BLUE Wilderness High Protein Grain-Free Wet Puppy Food is the best choice. Blue’s foods are made from all-natural ingredients and contain nothing artificial. Their specially formulated puppy food contains deboned turkey and added DHA to promote healthy development of the pup’s eyes and brain. Also, Omega 3 and 6 fatty acids are included to produce a glowing coat and healthy skin. There’s no grain added to the food, making it perfect for pups with sensitive tummies. If you don’t want your dog to eat anything other than completely natural, back-to-nature foods without going all-out and offering him a raw diet, you’ll want to choose a natural wet dog food. Rachael Ray Nutrish Natural Wet Dog Food comes in the form of a delicious stew and includes simple ingredients such as wholesome veggies and tender meat. The food contains no soy, wheat, or corn, fillers, or meat by-products. There are added vitamins and minerals, but no artificial preservatives or flavorings. This delicious natural wet dog food comes in a variety of tasty flavors, including beef, chicken, duck, and lamb that your dog is bound to love. If you have a senior dog, you might want to start feeding him a wet dog food that’s specially formulated with older pups in mind. As dogs age, they can begin to suffer from ailments such as arthritis and poor dental health. Feeding your dog a senior wet dog food can help to keep him healthy and enjoying life. Also, most senior wet dog foods are fortified with extra vitamins and minerals to boost the immune system and keep your older pup feeling fit and full of life. We think these are among the best senior wet dog food options available today. Purina Beyond Grain-Free Natural, Adult Wet Dog Food is made with the older dog in mind. The range includes lots of tasty recipes to tempt the fussiest of feeders, including chicken, lamb, beef, white fish, and turkey. All the foods benefit from the addition of wholesome fresh vegetables all presented in a succulent savory gravy for added flavor. The food contains no additives, grains, or gluten that might upset your dog’s tummy. Hill’s Science Diet Wet Dog Food is a premium wet dog food that is made using high-quality lean protein for lean muscle and perfect body condition. The easy-to-digest recipes in this range ensure optimal nutrient absorption with minimal stress to the dog’s digestive system to keep him fit and in great health. You can use this wet food in combination with Hill’s range of dry senior foods too. 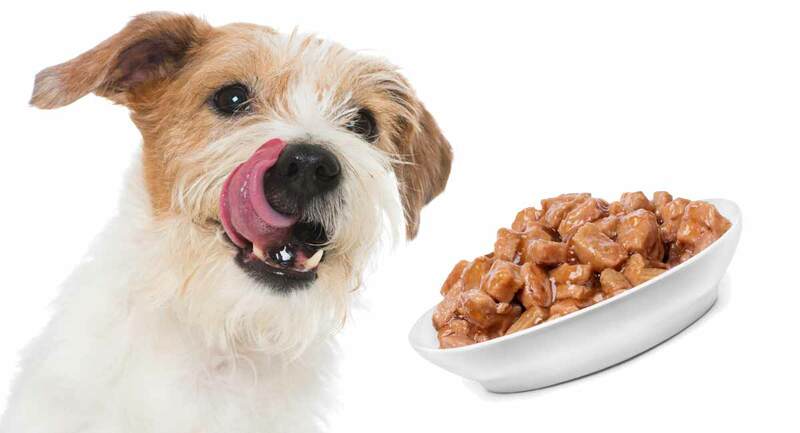 If you have a puppy that’s teething or you’re the owner of a senior dog with dental issues, you might want to consider feeding your pup a wet dog food. Also, wet dog food is great for tempting fussy feeders and can be ideal for dogs with sensitive tummies too. You can feed wet dog food on its own or in combination with a good-quality dry dog food. We’d love to know what you feed your dog! Tell us all about your furry friend in the comments section below. For example, what breed is he? What kind of food does he like best? Let us know in the comments if you chose one of the foods we reviewed for you in this guide!